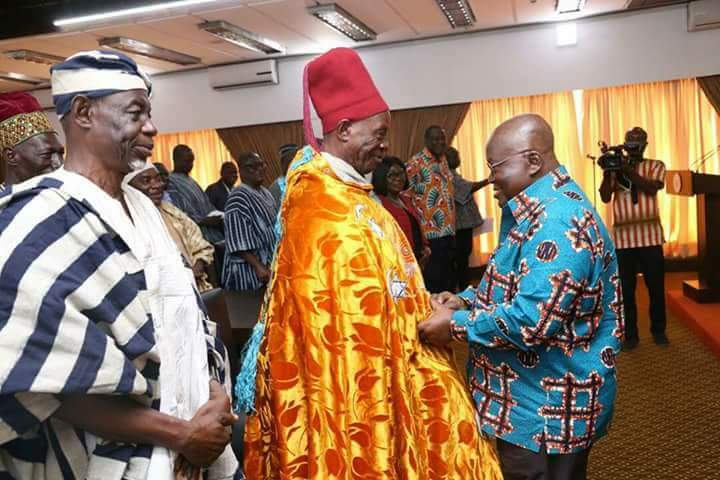 President Akufo Addo has assured the Chiefs and Queen Mothers of the Dorimon Traditional Area of his unflinching support in their quest to get their area developed. Addressing Eight (8) Chiefs, three (3) Queen Mothers, the District Chief (DCE) and other leading members of the Dorimon Traditional Area in the Wa West District of the Upper West Region when they paid a courtesy call on him, President Akufo Addo said all developmental initiatives in the area will be given all the attention it deserves. “The Projects that brought you here are ones that are well in hand. You know how important the Upper West in the scheme of things for those of us in the Danquah Dorimon Busia tradition. The Upper West is our home and therefore whatever we can do to make that home comfortable for all of us, we will continue to do,” the President said. Dorimon Naa Sohimwininye Danaa Gore II, Paramount Chief of the Dorimon Traditional Area and president of the Dorimon Traditional Council in his address, requested of the President to pay attention to their poor road network. The President assured that he is reliably informed by the Roads Minister that the road project will commence within the next ten (10) days. The Chief also suggested to the President to assist in the creation of a new district for Dorimon. On that score the President said he will be their personal advocate in order to get the new district created. The building of a community senior high school was the next request to which the President observed that the Education Ministry says it is one of several projects it intends to complete this year. Who were present at the meeting Among the chiefs present at the meeting were Naa Ingah Mwinseure Anang II, First Vice President of the Dorimon Traditional Area; Naa Aseidu Bawa, Second Vice Chairman of the Dorimon Traditional Area; Pognaa Yakubu Habibata, Paramount Queen Mother of Dorimon Traditional Area; Meiri Gaapie, Queen Mother of Oli; Ramatu Daah Ali, Queen Mother, Guo; Naa Bamwiela Kaapoure II, Assenaa; Naa Abeweh Saaka Mwinubu II, Nyaglinaa; Naa Alhaji Sidique Assumah, Songa; Dontanganaa, Naa Adamu Kaariba, Gbachenaa. Others who accompanied the delegation are the DCE for Wa West District, Laabiri Edward Sabo; Presiding Member of the Wa West District Assembly, Adams Osman; Ziema Marshall, a lecturer at the Wa campus of the University for Development Studies, and Dr. Gandoa Bananas, a son of the area.